ST. AUGUSTINE, Fla. (JTA) — For Rabbi Richard Levy, it was an emotional return to this historic northeastern Florida city. The first time Levy came to St. Augustine 50 years ago, he and 15 other rabbis and a Reform Jewish leader endured taunts from segregationists armed with broken bottles and bricks. They were jailed along with other civil rights activists after taking part in protests at a segregated motel. The rabbis’ June 18, 1964 pray-in outside the Monson Motor Lodge and Restaurant served as a decoy maneuver for other black and white demonstrators who jumped together into the motel’s segregated pool. Police responded forcefully. Associated Press photos of the angry motel owner pouring acid into the water and of a fully clothed police officer jumping in to haul out the protesters were splashed across newspapers the next day as the U.S. Senate voted to approve the landmark 1964 Civil Rights Act. Levy was speaking on the 50th anniversary of those events. Of the 17 members of the Reform delegation who were arrested that day, eight are still alive. 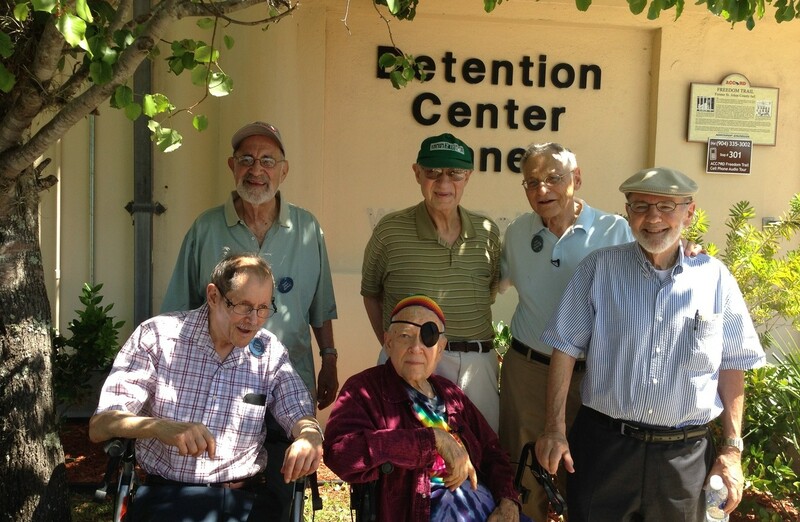 Levy and five others returned to St. Augustine for commemorative events titled “Justice, Justice 1964” that were organized by the St. Augustine Jewish Historical Society. The rabbis had come to St. Augustine a half-century ago at the invitation of the Rev. Martin Luther King Jr., whose Southern Christian Leadership Conference was working with students and activists to fight Jim Crow segregation in the city. A focal point for the protests was the 400th anniversary celebrations of the city’s founding by the Spanish explorer Pedro Menendez. Blacks had been excluded from the committee that planned the federally funded commemorations. Media coverage of the ongoing St. Augustine protests and the violent resistance to them by segregationists had put pressure on Congress when the Civil Rights Act was facing a filibuster. A week before the rabbis’ protest, King himself had been arrested outside the Monson Motor Lodge. King penned a letter from jail to his friend and supporter Rabbi Israel Dresner of New Jersey asking for help. “We need you down here with as many Rabbis as you can bring with you!” he wrote. The rabbis came directly from the Central Conference of Rabbis meeting in Atlantic City, N.J., where Dresner read the message from King. Rabbi Allen Secher recalled being shocked by the violence of white law enforcement officials as he and others were hauled off to the St. Johns County Jail. King had called St. Augustine one of the most violent places he had ever visited. On the 50th anniversary visit, much had changed. The rabbis were feted and welcomed by the mayor and the St. Augustine 450th commemoration officials. The St. Augustine Jewish Historical Society brought back Levy, Dresner, Goldstein and Secher, as well as Rabbis Daniel Fogel and Hanan Sills, to shine a light on values that motivated the Reform rabbis and their allies in pursuit of justice. The Union for Reform Judaism’s Religious Action Center in Washington, D.C., played a particularly important part in the push for civil rights. The landmark Civil Rights Act and the 1965 Voting Rights Act were drafted in the RAC’s conference room by civil rights leaders. “From these events we see a coalition of people can change America,” Al Vorspan, the now-retired Reform leader who was arrested along with the rabbis, said in a telephone interview. At the time of his arrest, Vorspan was the director of the Commission on Social Action at the Union of American Hebrew Congregations, the URJ’s predecessor. Today, the RAC is mobilizing support for a Voting Rights Amendment Act, a response to the Supreme Court’s decision in Shelby v. Holder last year that struck down a key provision of the Voting Rights Act. The Jewish liberal advocacy group Bend the Arc has launched its own campaign in support of the voting rights legislation. It sent out an email appeal from David Goodman, the brother of one of three civil rights workers – one black, two Jewish — murdered in Mississippi only days after the rabbis’ arrest in St. Augustine. Fifty years ago in St. Augustine, from the cramped and steamy cell in St. Johns County jail where they spent the night, the Reform leaders penned a letter titled “Why We Went.” Rabbi Eugene Borowitz, today one of Reform Judaism’s most eminent theologians, organized the effort. It was drafted on the back of two sheets of a Ku Klux Klan flier. The six rabbis who came back to St. Augustine last week read the moving letter aloud to another capacity crowd. Like rock stars, the rabbis signed a blown-up draft featured in an exhibit on the area’s African-American history. The commemorations wound up with a heartfelt concert that brought together a number of clergy and choirs from the St. Paul A.M.E. church and Bet Yam Reform synagogue. Anniversaries, Dresner reflected, are beneficial to revive the memory.